In 2009, Drew Estate asked their torcedores to smoke less Liga Privada cigars because they were leaving too few to be exported to the legions of cigar smokers who had come to love the blend. The torcedores responded by blending their own Liga, aptly named Undercrown as the binder and filler tobaccos are "inverted" using the same leaf in the Liga Privada blend, but from different vintages and primings on the plant. Undercrown is made with the same uncompromising quality and flavor as the Liga Privada, but the rarer Connecticut wrapper is replaced with a dark San Andrés. The end result is an impressive medium- to full-bodied cigar with earthy, creamy, and spicy notes and a delicious black tobacco sweet finish. 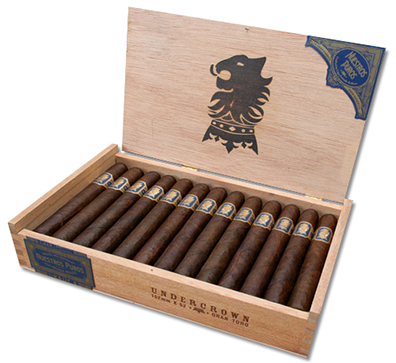 Undercrown cigars are so good, in fact, that demand may quickly outstrip supply just as it has with its Liga siblings.